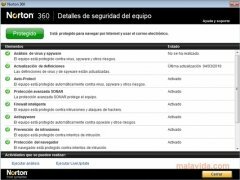 Norton 360 is a security suite that includes several tools to protect your PC. Antivirus, firewall, backups and more thanks to Norton 360, download it now! Symantec is one of the best known and most important security software companies worldwide, and this is reflected in each one of their products. 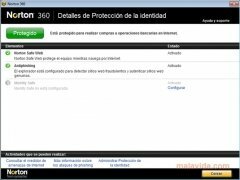 Norton 360 is a very complete application, that integrates all the tools necessary to keep our PC safe 24 hours a day. The program is made up by different blocks: antivirus, firewall, Norton Insight, a system to perform backups, Norton Safe Web and Identity Safe. Each one of these tools will keep us protected against the different threats that affect our computer due to the use of the Internet. - Constant protection without affecting our computer's performance. - Automatic detection of botnets. - Security system to buy on the Internet. - Protection of wireless networks. - 2 GB of online storage space to protect our most important data. - Real-time update system that looks for new virus definitions every 5 minutes. Furthermore, the application's control panel is very simple, without requiring great computing knowledge, to maintain any threat out of our computer's reach. It's all divided into blocks and is very simple to program our computer to analyze discs or control how the firewall works. If you can't find an application to be used to protect your computer completely, 24 hours a day, you can resort to Norton 360, one of the most complete security suites on the market. The trial can be used for 60 days.